Client: Tony CurtisWebsite: www.alago.co.ukPatent Status: Alago has a UK patent pending. The challengeTony Curtis came to Innovate in 2008 with his unprotected invention idea for a heat-dispersing glove to be worn before and during participation in sports activities. Having watched his son come off the sports field on a freezing cold day shivering and with icy hands, Tony thought that there must be a solution beyond just rubbing your hands together.The Innovate SolutionInnovate’s first recommendationwas to engage their services in order a thorough patent search which would aim to establish the full breadth of existing intellectual property coverage in. Having completed this and Tony feeling that there was still potential for the Alago concept, Innovate helped to develop the concept through visualizations. This developed the underlying functionality of the concept and gave Tony the opportunity to realize his vision for the Alago glove. The product design team created a number of concepts for the heated glove which were run past Tony in order to obtain his feedback. Innovate then proceeded to the CAD (Computer Aided Design) development in order to produce photorealistic renders of the Alagoidea. After overcoming a number of technical issues, Tony was able to protect his invention via making an application for patent, before approaching a manufacturer to develop the final product. 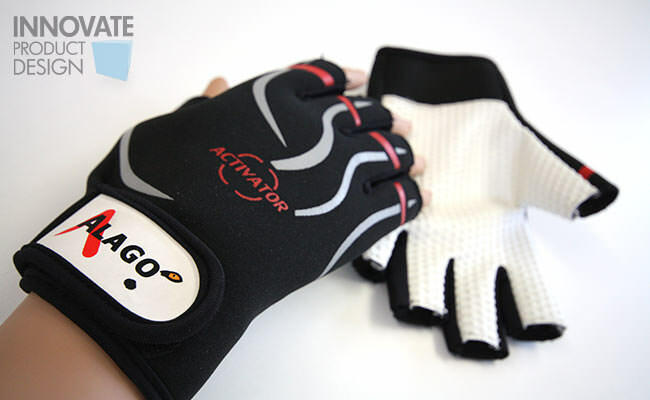 The ResultsSince the launch of the Alago glove in 2011, the product has featured in the likes of Enterprise Nation, Alibaba, as well as The Telegraph and Guardian newspapers in the United Kingdom and the popular television show Dragons’ Den.